I thought before summer completely passes us by I would share a couple of summer themed berry cards that I made for past magazine calls. I must admit fruit images make me happy. 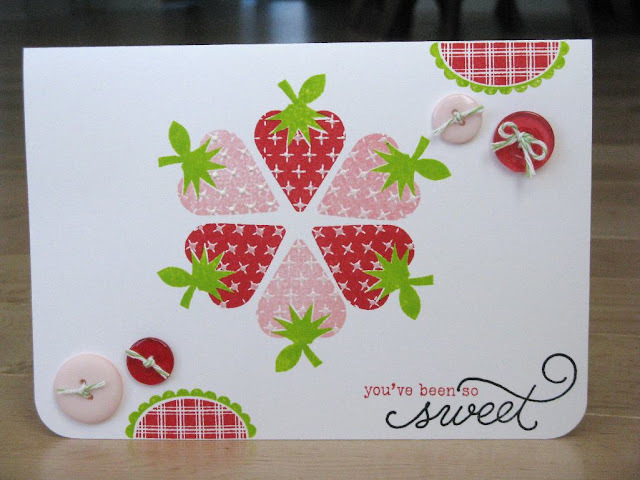 I made this first one using Technique Tuesday new set called A Little Fruity which I paired with a sentiment from Papertrey Ink and Dots & Stripes papers by Echo Park. For this call they challenged us to submit cards that repeated a stamped image 7 times so this was my take on the idea. This second one I made over a year ago in response to a Paper Crafts call for cards that used a particular sketch (by Teri Anderson). 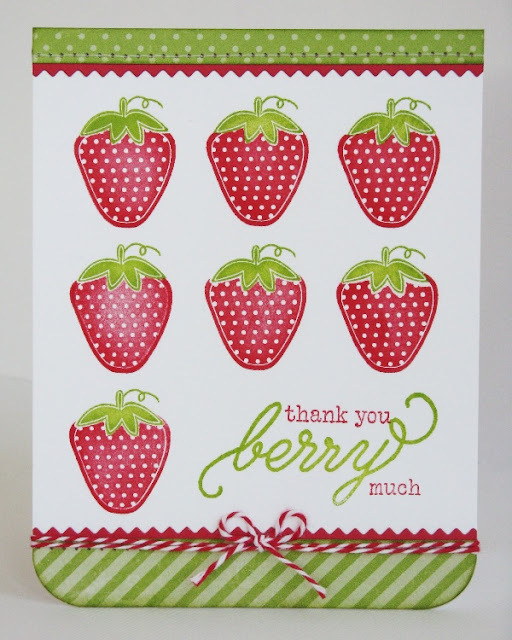 Of course it was a November/December issue and this was way off season so it didn't get picked up, but I had fun finally playing with my Fruit Fusion stamps by Papertrey Ink. I used a little dots of white enamel by Ranger for my strawberry seeds and various buttons my Basic Grey. Beautiful cards my friend! I absolutely love them both and I love how you created a flower shape from the strawberries in the 2nd one and alternated the colors. Very sweet!